We’re so excited to be revealing the second part of River City Apartments renovation! In total, we renovated 448 apartments, with 14 different unit types ranging from studios to 1-beds all the way to triplex penthouses. Each one is incredibly unique and has its own set of challenges. In this tour, we’re taking you through one of the duplex 3-bed “Townhouses”. All of the townhouses in River City open up to “River Road”, an indoor sky lit atrium that resembles a private neighborhood. Similar to what you saw in Part One, these units were incredibly dated, crowded, and inefficient. Our biggest move, was to open up the galley kitchens and create an open concept kitchen, living and dining room. We really focused on modernizing these floorplans to create an open concept space with plenty of storage and an efficient kitchen layout. Upstairs, we removed a lot of closet doors and unnecessary walls to create a huge master bedroom with a walk-in closet and two standard bedrooms that share a bright, modern bathroom. The first floor transformed into an incredibly bright, modern, and HUGE kitchen, living and dining area. We moved the soffit in order to expand the kitchen into the dining area (still leaving plenty of room for a dining table and chairs) and arranged appliances and plumbing along the back wall, with a huge island in front of it. We kept the finishes cohesive with the other units in here, but upgraded the countertops for a marble-look quartz to give a more special look in here and really amplify the lightness and airiness of this unit. The living and dining area are huge for an urban apartment. 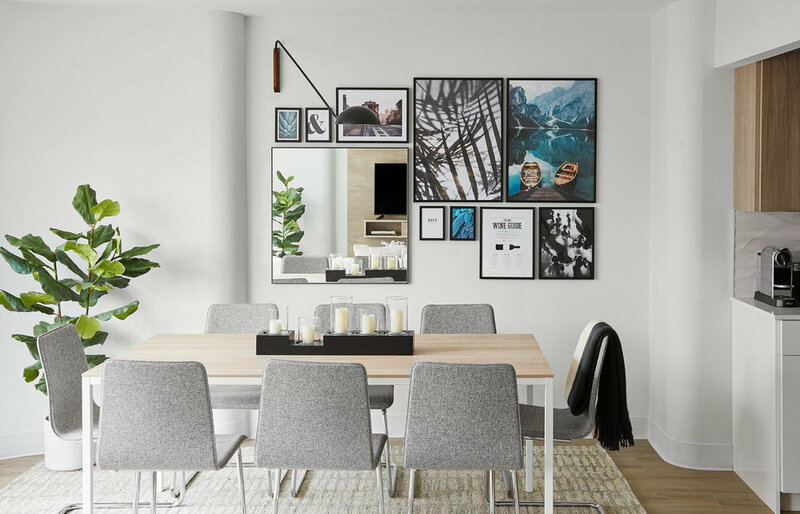 We styled the model unit with an 8-person dining table, backed with a modern gallery wall to tie in with the other model unit’s wall, and an oversized white sectional facing the TV wall. Ordinarily, I’d shy away from a pure white sofa, but this is a model unit, so YOLO! 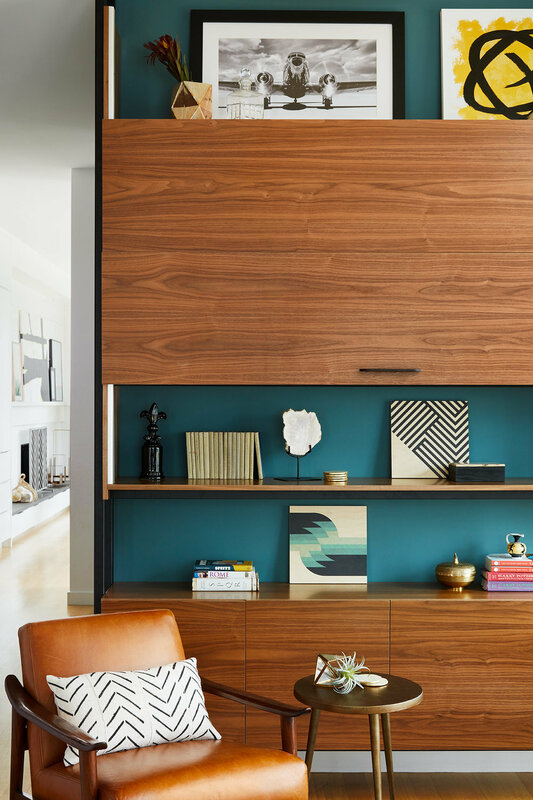 We mounted a wooden media console on the wall to frame the TV and styled the room with warm textures, organic materials and clean, modern profiles. This gallery wall is one of my favorites we’ve done. We pulled in nostalgic imagery to relate to the building’s branding and added a mirror in to reflect the living room and tie the spaces together. To top it off, We added a wall sconce to arch over the dining table add another light level. 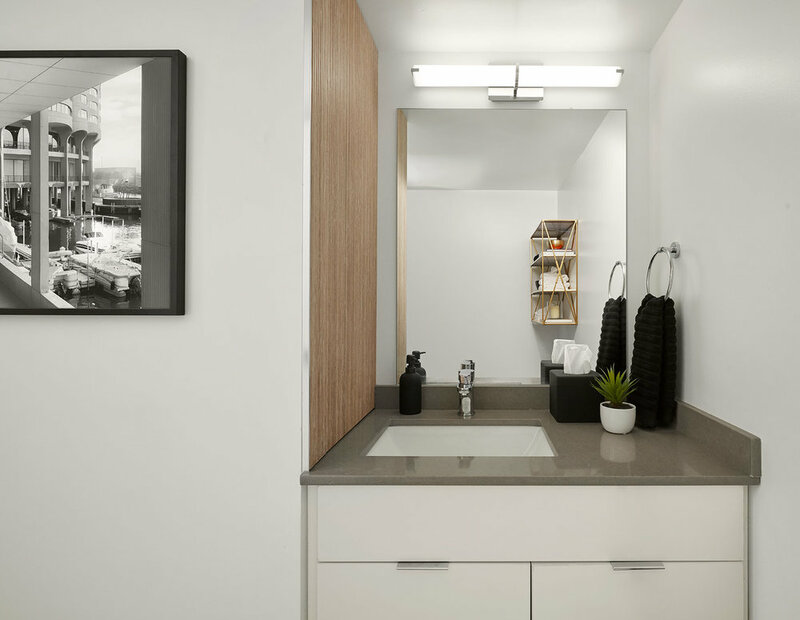 In the front of the unit, the townhouses have a laundry room with a washer dryer and space for shelving or a desk as well as room for a reading nook to create a cozy first impression from the entryway. The townhouses also have a powder room tucked up front, where we pulled in a wooden accent tile to add an unexpected pop. Moving upstairs, we’ve got two bedrooms, one that we styled as a bedroom and the other as an office. 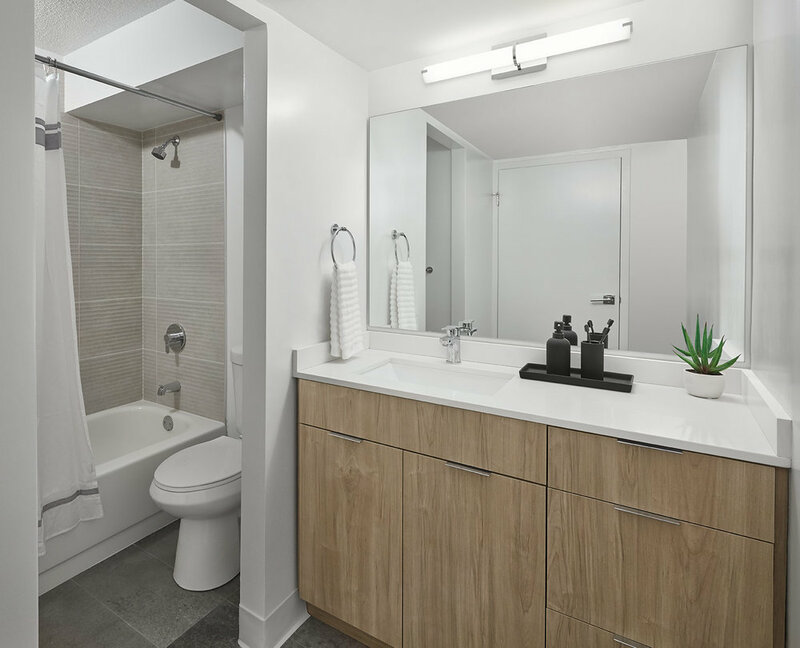 The two bedrooms share a bathroom that we updated with a modern, textural tile in the shower and concrete-looking floor tiles, similar to the other units, as well as a wooden vanity with a white quartz countertop. Completing the second level, there is a HUGE master bedroom overlooking the city skyline and river. We styled this room in the model with a king bed, a console table with a TV and a desk in the nook behind the walk-in closet. 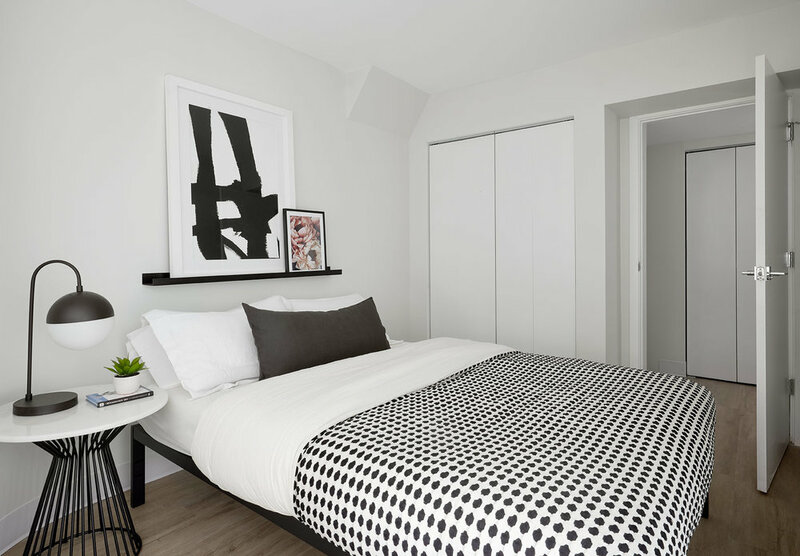 We kept this room bright and white with textural bed linens along with wood in the desk and concrete in the console table to tie into the finishes we brought into this unit. The master bath isn’t huge, so we had to get creative to brighten it up and make it feel more spacious. We weren’t able to expand it due to existing plumbing locations, however, we opened up the wall between the vanity and the toilet to create one unified room and then maximized the space with a linen cabinet tucked behind the door where there originally was another tiny, cramped closet. 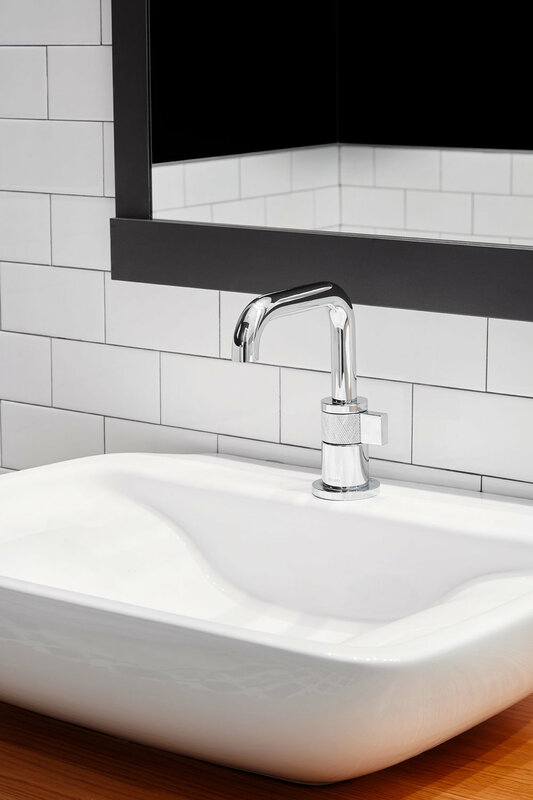 Bright, natural textures modernize the bathroom and make it feel luxurious and cohesive with the rest of the unit. I hope you guys enjoyed this tour! I had the best time working on this project and I’m so proud of how it turned out. This space has been completely updated to be relevant with today’s expectations while still tying in with Bertrand Goldberg’s original unique design. If you’re interested in touring the apartments or learning about the building further, check out the website to schedule a showing! 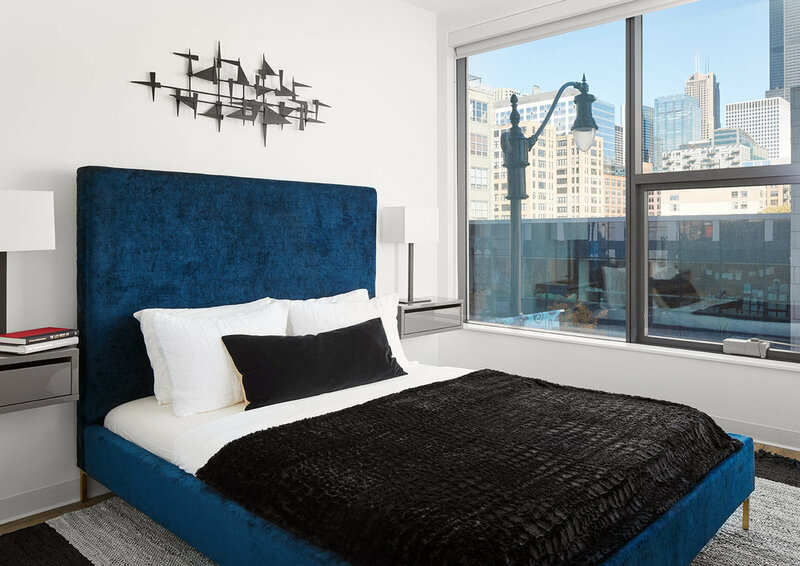 We are so excited to be sharing the behind the scenes tour of the renovations we designed for the newly minted River City Apartments here in Chicago. 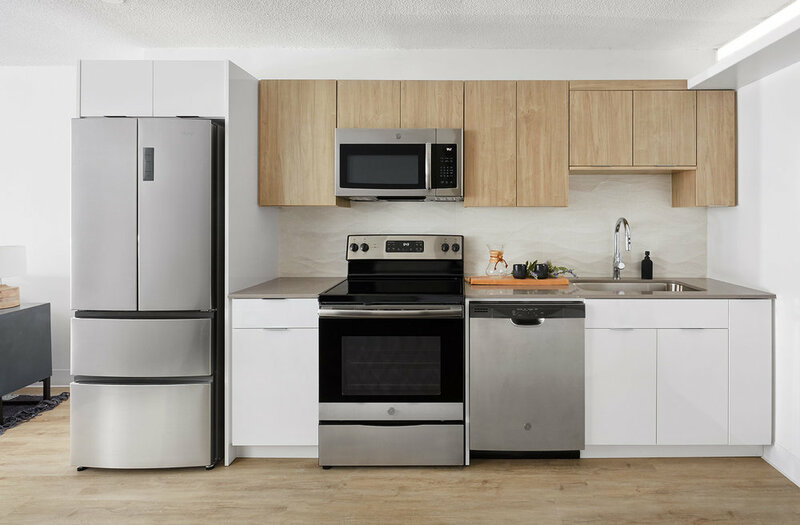 Today, we're sharing some before and afters and walking you through our design for these updated units. There's no use in sugar-coating it, these units were in ROUGH shape when we started. Most units had original finishes, fixtures and layouts, which were very compartmentalized and felt crowded, dark and impractical. I felt like everywhere I looked there were doors. Areas were divided and closets were tucked everywhere...even when they weren't practical to access. Our first priority was to clean up the layouts and make them feel more spacious and efficient for users. From there, we aimed to brighten up the space and introduce more modern, warm finishes. 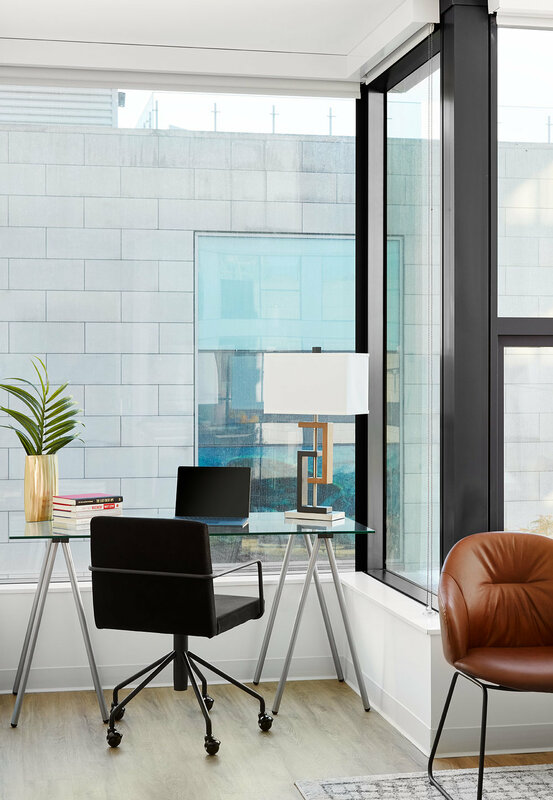 The entire team agreed we wanted to honor the existing modern architecture of the building but brighten up the units with warm, natural textures. 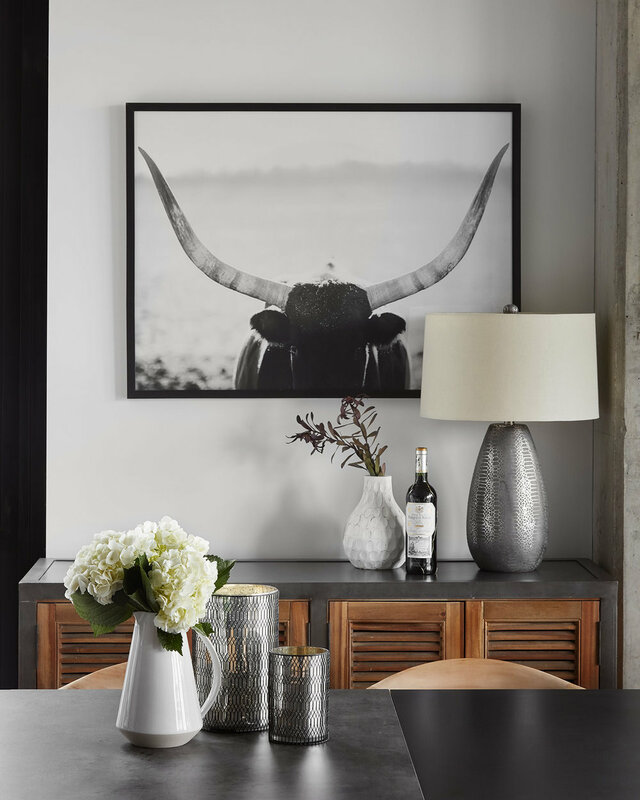 We immediately gravitated towards inspiration images that pulled in white walls, concrete textures and warm wood tones. From there, we created a moodboard, highlighting the finishes and textures we wanted to incorporate into the design. We primarily focused on natural and organic textures, pulling in the lines from the concrete structure and curves from the serpentine design of the building. The palette that emerged included concrete tiles and counters, wood accents and floors and sculptural wall tiles. 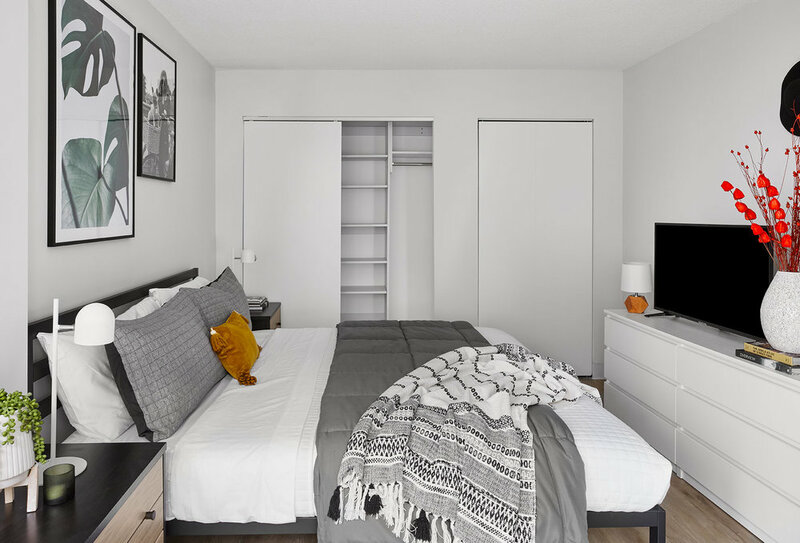 We cleaned up the floorplans, taking advantage of the existing large bedroom and living space and cleaning up the closet layouts to make the space more efficient and practical for today's standards of living. 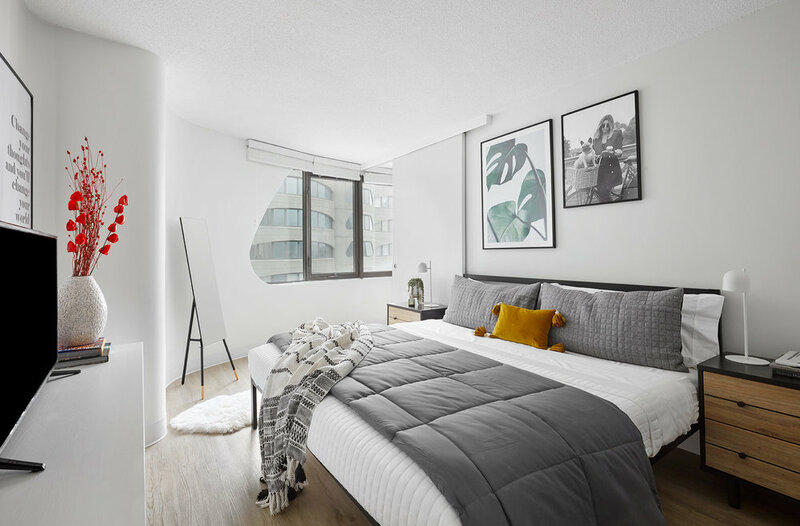 The Junior 1-Bed units have an open concept kitchen spilling into a large living room with the iconic curved windows. A sliding barn-door separates a huge bedroom, large enough to fit a king-bed comfortably. The custom closets along the back wall provide plenty of space for one or two people to share. The front area includes a washer/dryer space, a coat closet and a large bathroom opening up off the kitchen. We completely opened up the kitchen and incorporated modern, clean lines into the cabinets to really brighten up the space. 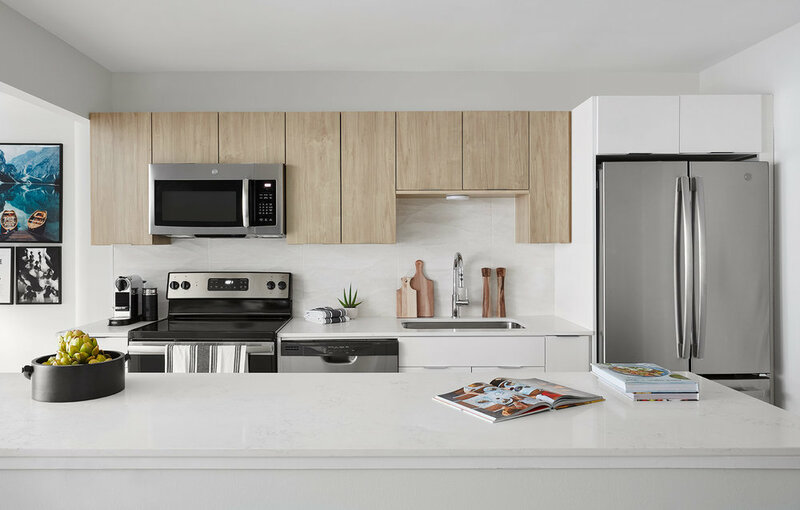 Wooden upper cabinets tie in with the light wood floors and add warmth to the white lacquer lowers and concrete-looking countertop. We incorporated a unique, sculptural backsplash, imported from Spain to add a dramatic texture and tie in to the fluid forms of the building. The kitchen opens up to a bright, large living room, featuring the iconic curved window. 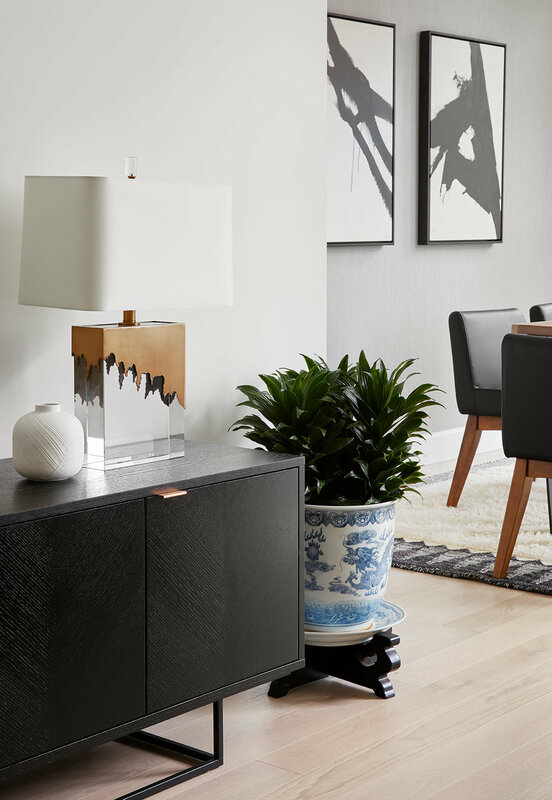 We styled the living room with retro-inspired modern furnishings and created an area that users can unwind in at the end of the day or comfortably entertain in. A barn door separates the living room from the bedroom where we styled a modern king-bed along with a full-sized dresser and accessories to tie the space together with the living room. 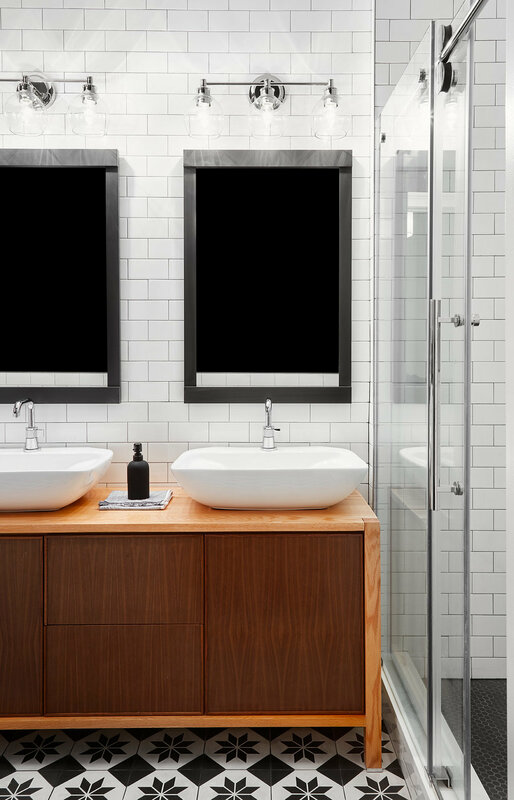 The bathroom off of the living room mimics the kitchen with a modern wood vanity, concrete-look floors and a white quartz countertop. I hope you guys enjoyed this tour! If you're interested in learning more about the River City Apartments and want to schedule a showing, check out their new website here. At the end of the week, we'll be sharing a behind the scenes look of one of the duplex townhouses next! We just wrapped up the first floor design for a family of seven in Chicago’s Pilsen neighborhood and we are so excited to share the photos! 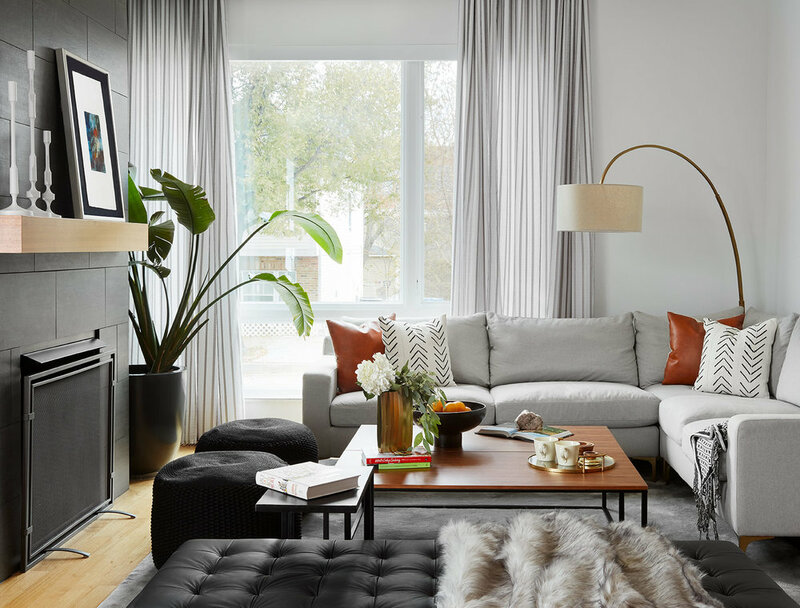 This home needed comfortable, family-friendly pieces that look polished and modern. 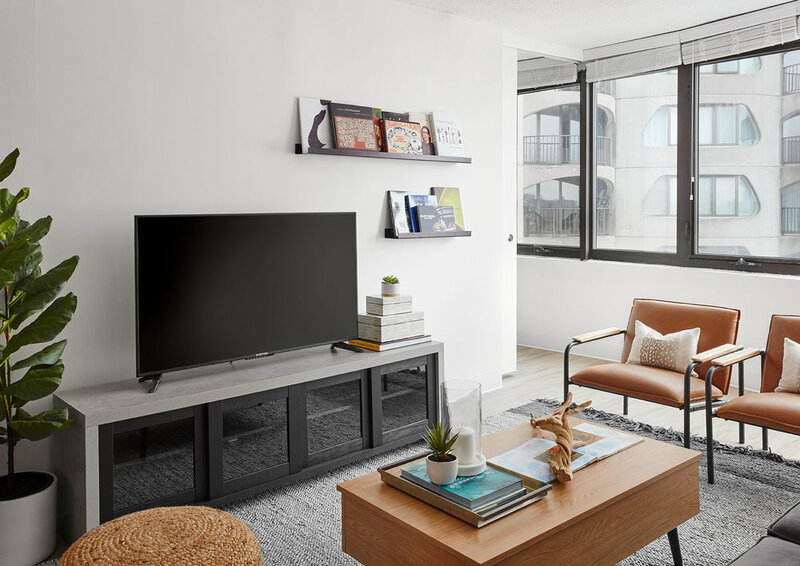 In the living room, we worked with Icon Modern to build a custom TV-cabinet so that the family can hide the TV when it’s not in use, and sprawl out on the corner sectional to relax with a movie when it’s open. In the dining room, which had originally been the family room, we worked with the existing white-lacquer paneling above the fireplace and built a floating shelf into the bottom of it, allowing us to arrange oversized artwork and hide the opening for a TV. We used FLOR tiles to create a stain-resistance area rug that accommodates the custom table for 12. 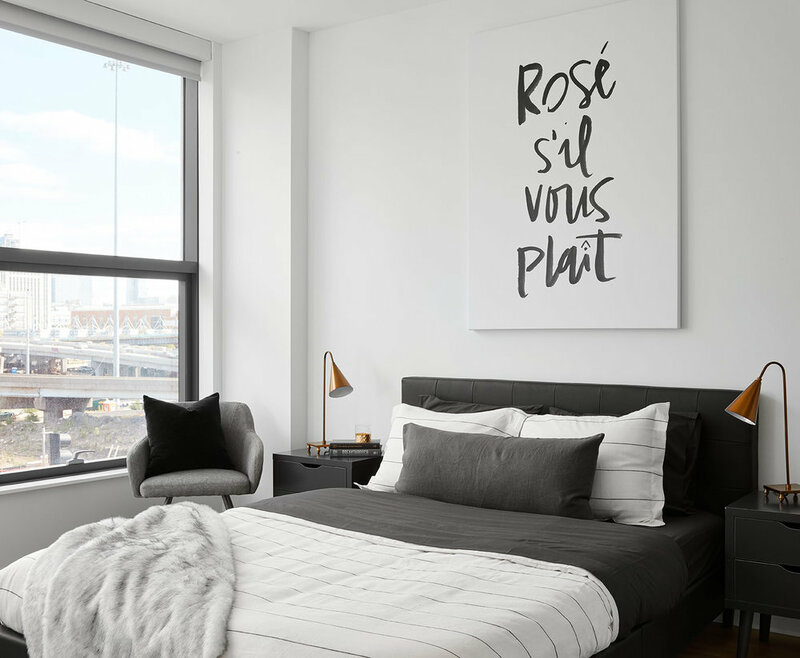 We used a more feminine palate for the two bedroom model unit in the Van Buren building. In both rooms we incorporated a variety of textures but kept the colors pretty neutral. The “Rose s’il vous plait” print is oversize so it makes quite a statement and adds a playful touch. Thanks for checking out this model unit. We have lots of new projects being photographed in upcoming weeks - stay tuned for more! This is the first of two model units we did for the new Van Buren building in the West Loop neighborhood in Chicago. We focused on clean lines to echo the modern vibe of the new build. Here are a few of our favorite scenes from the one bedroom, we hope you enjoy it as much as we do! 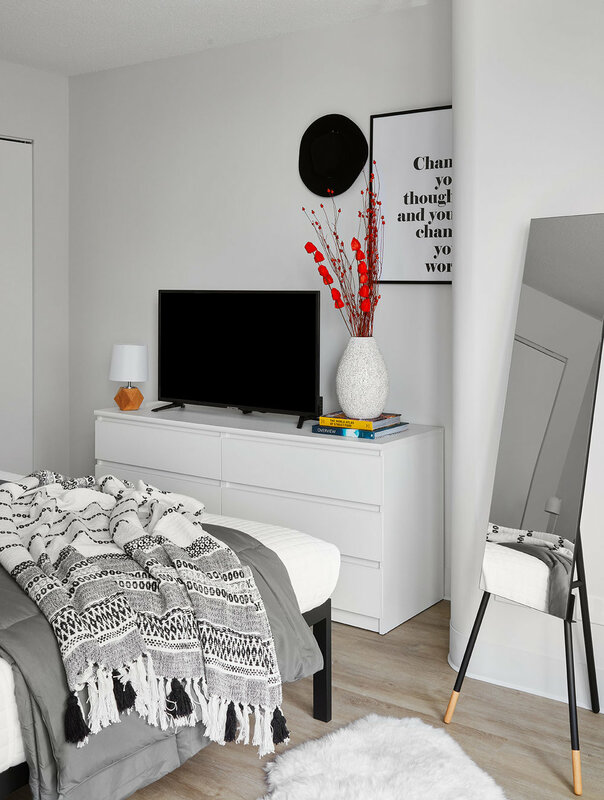 The blue bed adds quite a pop of color to an otherwise simple and sleek bedroom. Plush velvet brings warmth and texture. The living space in the apartment is open concept so we wanted to keep the design simple and cohesive. Using the same lamp on the office desk and the couch ties the spaces together. 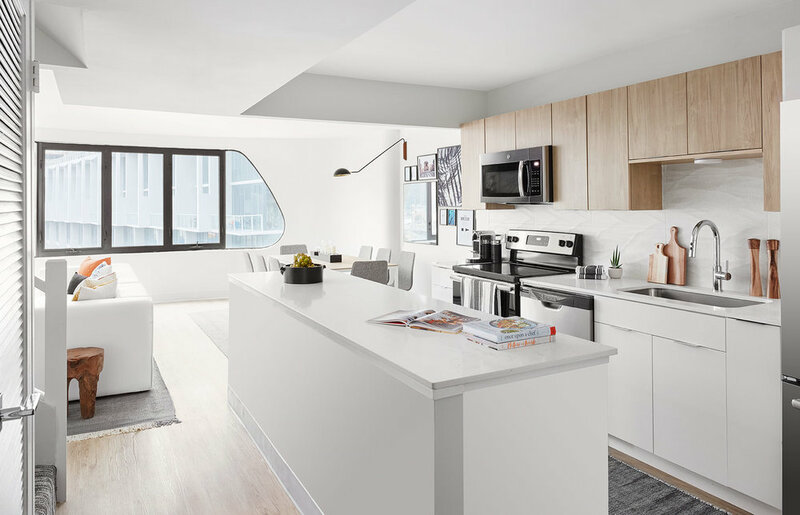 The open concept kitchen takes advantage of natural light from the floor to ceiling windows throughout the apartment. We hope you enjoyed this apartment tour as much as we loved putting it together! Stay tuned next week for the two bedroom next door. We have an exciting new reveal today featuring a project that was almost a year in the making. 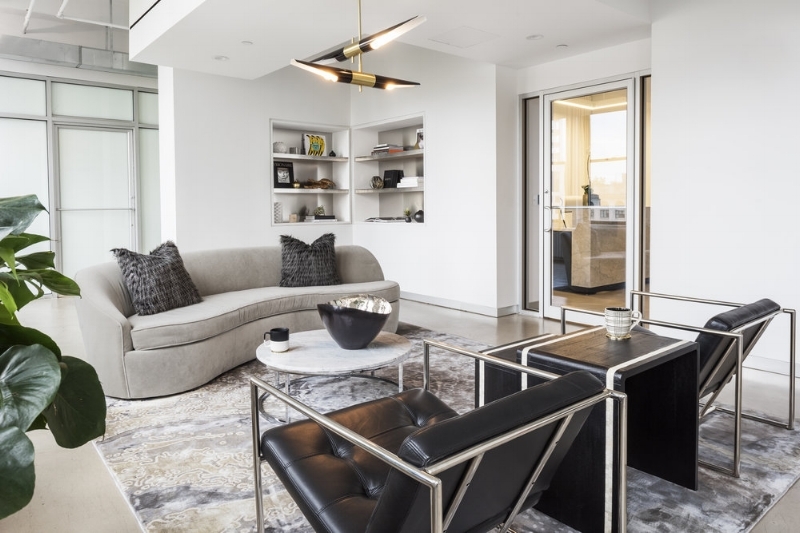 This client moved into a 3 bedroom new-construction penthouse in West Loop from a 1-bedroom apartment and needed all new furniture to fill it up. 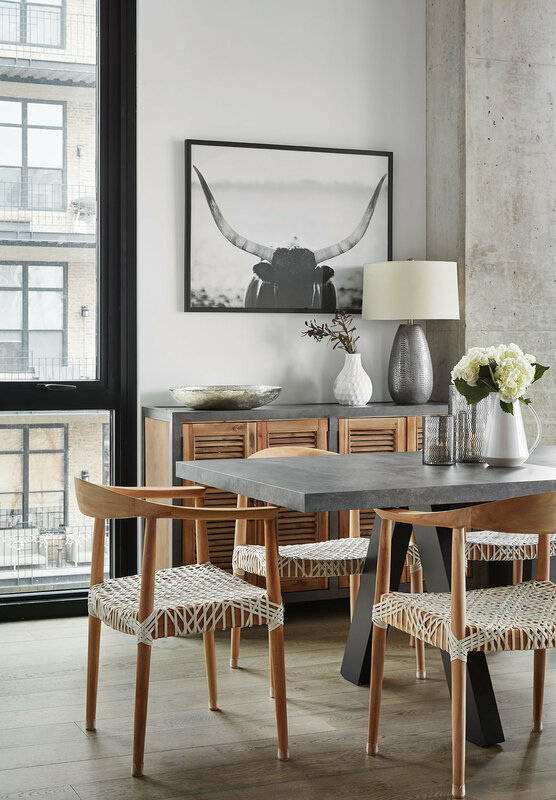 Starting with wallpaper, light fixtures and window treatments to set the scene, Devon incorporated a clean, modern aesthetic into the space with touches of modern industrial to reflect the neighborhood. Family antiques were thoughtfully introduced to balance the modern base. The space is set up for entertaining with a large living area complete with green velvet sculptural accent chairs. The dining area sets a dramatic tone with a dripping black metal chandelier and a bold diptych on a silk wallpaper. To balance the dining area out, Devon incorporated an antique corner cabinet that belonged to the client and had it refinished with MegMade to modernize it and help it fit with the rest of the space. The master bedroom is one of Devon's favorite's yet. 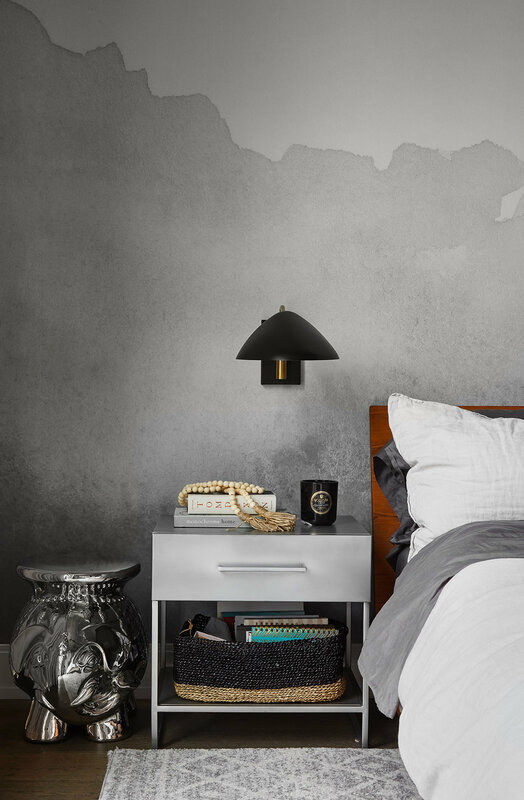 The accent wall behind the bed is a suede wallpaper, adding a soft touch to the room along with a moody, dramatic statement. Everything in this room was kept simple and clean, to provide a calm space for the clients to recharge each night. We hope you enjoyed the reveal! See you next time! We had the honor of completing not one, but two of the offices for Ford Models this past year. 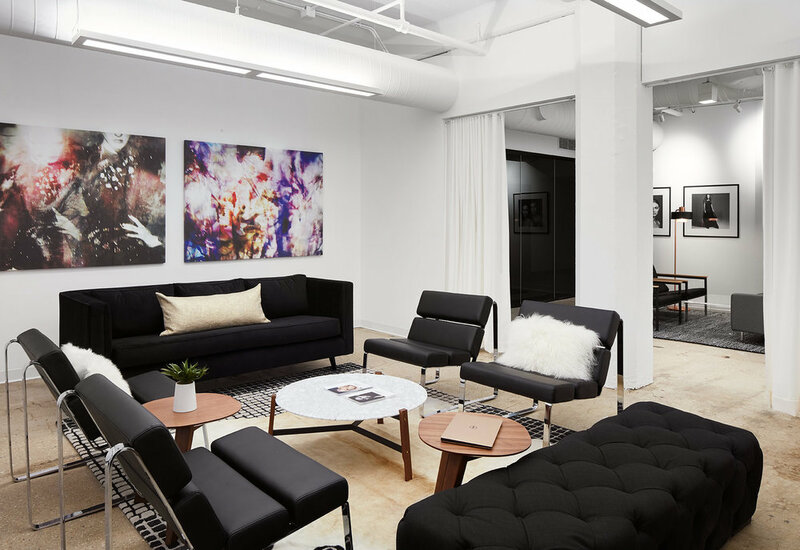 Here's a look inside at the minimal, modern and industrial space we designed for their new Chicago office. We pulled in elements similar to those seen their New York office, such as a monochromatic palette with rich textures and clean lines. 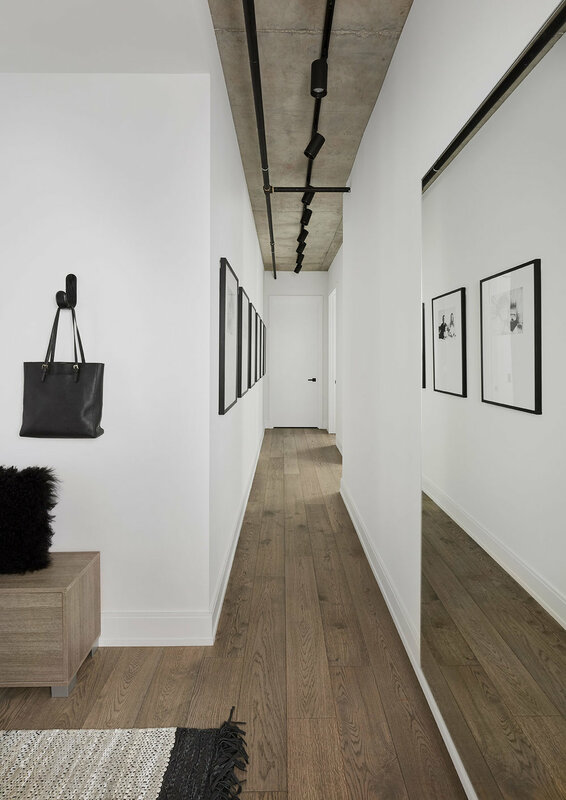 To tie the brand into their new neighborhood, we blended the sleek, modern aesthetic with the industrial vibe of the West Loop using exposed concrete floors and rich wood accents. 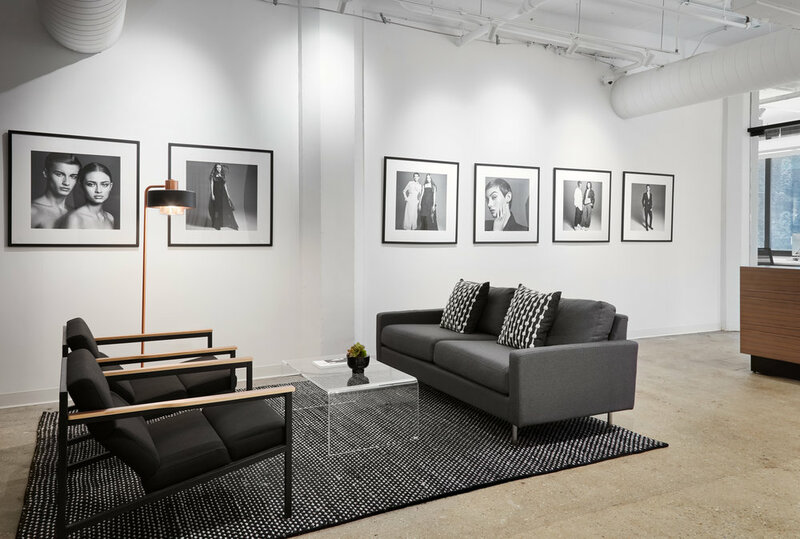 A modern, black and white gallery wall showcases their new work in the reception area. The model lounge provides a space for models to relax in between meetings. We layered a lot of textures in here such as suede drapes, a hide rug, a tufted bench and a velvet sofa to give a rich, inviting feel. The open office is sleek and clean, with white benching stations along the windows and floating shelving to display model cards throughout. Relativity Textiles created a custom plaid wallcovering to introduce a subtle texture throughout and breakup the white walls. And finally, the conference room gets right to business with a white lacquer table, black leather and gold chairs, and a black strung light fixture. We hope you love the space as much as we do! 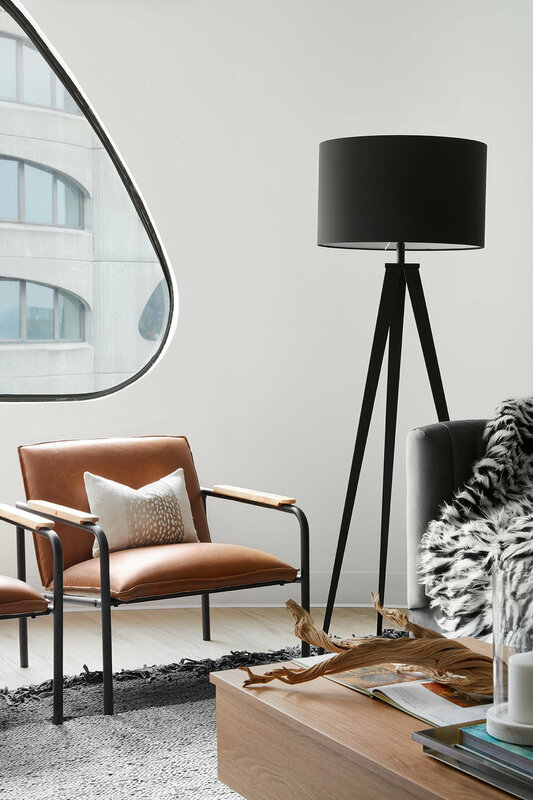 If you want to see what we did in Ford's New York office, check out the tour MyDomaine featured here. We just wrapped up one of our favorite bathroom renovations over in Wicker Park. After already working with the client on their living room and dining room, Devon had a strong understanding of their style and was excited to kick off this modern yet subtly vintage bathroom renovation. Scroll down to see the before and after photos! In my opinion, a great designer creates a space that is timeless and tailored to a client's specific aesthetic, not one that is trendy and will need to be redone in two years. For this reason, I typically tend to tune-out when I hear of the latest trends, however there were a few that caught my attention for 2018 that I think are worth exploring. 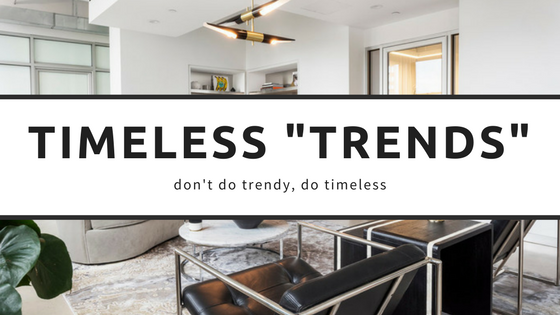 Read on to see the three "trends" predicted for 2018 that I believe are here to stay and will leave you with a design that you can enjoy for many years to come. I know, surprise surprise, I love monochromatic decor. 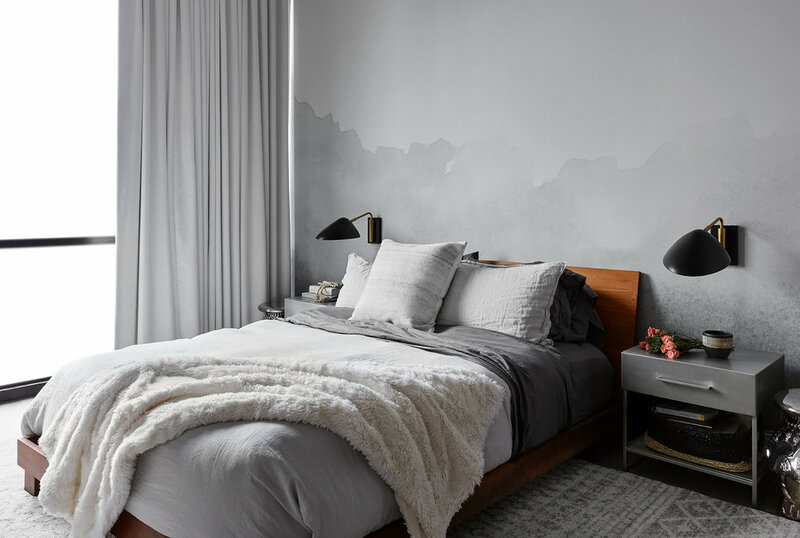 While this has now been labeled "trendy", in my opinion there is nothing like a neutral color palette to create a timeless canvas for your space. If you like trends or colors that change over time, bring them in as small accessories which will fit in perfectly with your cohesive, "tone on tone" backdrop. Monochromatic palettes also allow natural materials like woods, metals and greenery to really pop and become the focal points of the room which adds a level of elegance and sophistication. You can trace this "trend" back centuries. In fact, I think this is the safest way to introduce a new metal if you're nervous about how it'll age with you. Matte black piquing your interest? Or satin brass? 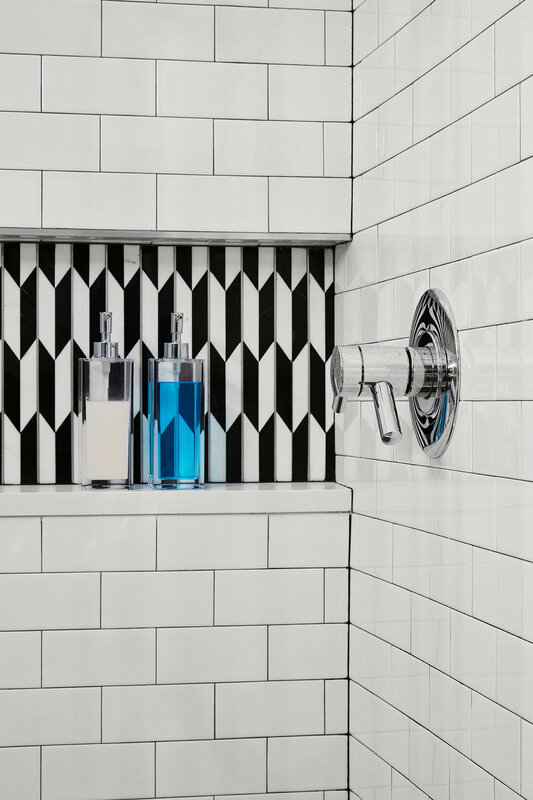 Mix them in with some chrome fixtures to balance things out. My general rule of thumb is to stick to two or three per room. Any more than that and you risk visual clutter. The kitchen is a great room to try this in. If you have stainless appliances, add chrome plumbing fixtures and cabinet hardware with some copper accessories styled throughout. If you've ready any of my previous blogs, you'll know that I am obsessed with creating healthy homes and healthy spaces. One of the BEST ways to do this while enhancing the decor is adding in plants! Check out my post on 5 Houseplants You Need in Your Life if you need ideas to get started. I am in disbelief that the holidays are already here. That said, this is easily my favorite time of year, EVEN THOUGH the sun sets before 5pm. Now that you all are going to be spending more time indoors, I’ve collected some of my favorite things to make your home cozy and help you survive the winter. Links are below! 1: This blanket by Artizen Home looks as cozy as it feels. 2: One of my best friends just turned me onto this smell and I can’t get enough of it. 3: AKA my work uniform. 4: Because they’re just so good. 5: We just got a dutch oven as one of our wedding gifts and it has been a game changer for cozy, hearty meals. 6: Winter weather means dry air. Make your home more comfortable and keep your wood floors from checking by keeping humidity levels around 45%. It can be done in style now! 7: Treat yourself to breakfast in bed on those chilly mornings. 8: Mugs are some of favorite things to collect. When I moved to Chicago from Boston, I had two suitcases full of clothes and box of my mugs. Check out Society-6 for some other fun designs. 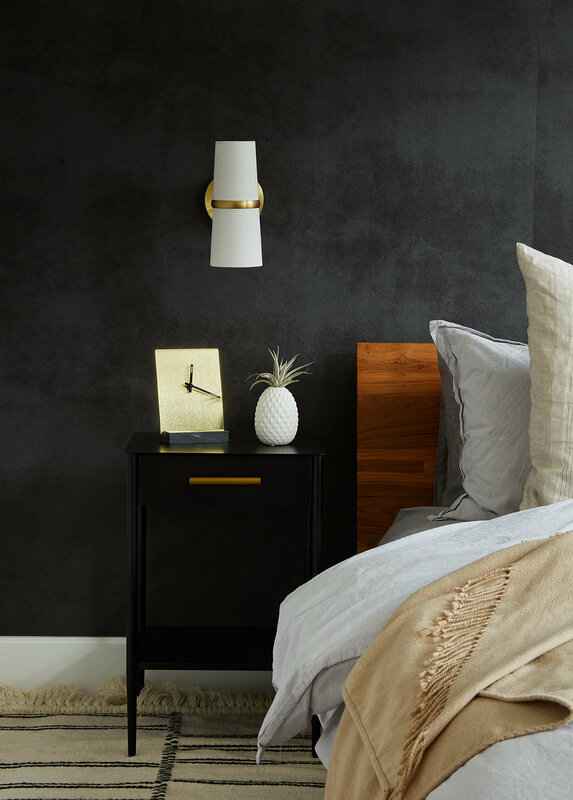 9: Brighten up your home to make darker evenings a little more bearable. 10: Spending more time indoors means it’s crucial to improve your air quality. Bring plants indoors to increase oxygen levels and reduce the level of VOC’s in your air. These past few weeks I've been frantically booking vendors for our wedding next summer, trying to get it all done before the holidays. All that's left is a florist and I've recently had the pleasure of meeting with a few and being on the client-side of a design consultation for a change. My mind is blown with how much they are able to do and how complex the world of flowers is. Understandably, this has also been my favorite vendor to book because it was all so visual. I decided to translate what I learned into interior design ideas and am focusing on my Top Six Picks for fall flower arrangements this week. 1- Dahlia: Someone told me once that if I was a flower, I would be a Dahlia, and since then they've always been my favorites. While soft blush Dahlia's will be the main flower in my wedding arrangement, these flowers come in a variety of deep red and orange colors, making them my top pick for fall flowers. Pair the fierce, geometric bloom with some soft greenery to create a balanced, welcoming look in your home. 2- Celosia: This has always been one of my favorites because of the unique, structured look it has. These can be worked into an arrangement or they can stand alone for a simple, statement piece. Celosia can also be dried and kept around throughout the winter. 3- Leucadendron: These were new to me until recently. I love the warm tones this flower brings in and the spiky, edge it adds. These too can stand alone and bring in a lot of dimension if they're kept long in a tall, glass vase. 4- Bicolor Rose: It doesn't really get more romantic than a rose. In the fall, I like to bring in BiColor Roses to add dimension to an arrangement and pull in some deeper, warmer hues. I always add some greenery to rose bouquets, like Eucalyptus or Solidago to contrast the perfect silhouette of the Rose and introduce some texture. 5- Calla Lily: If you want to introduce some flowers without bringing in too much color, Calla Lillies are your best option. These classic beauties instantly add elegance to any space they're in as well as a subtle green pop. Arrange these by themselves in a glass vase to maintain a minimalistic, clean look. 6- Orange Gerbera Daisy: If you want to add a more cheerful, playful look to your space, I'd recommend a cluster of Orange Gerbera Daisys. In my opinion, these are the most cheerful flowers out there and the orange hue brings in the warm colors of autumn. Add some greenery like Eucalyptus to really add a pop of color to the space. I hope these inspire some great ideas. Be sure to tag me if you arrange any flowers in your home, I'd love to see what you come up with! It's no surprise when you look at my work that I love to use crisp neutrals in my designs. Today, I'm rounding up my favorite whites that give a warm, bright look without looking sterile. 1- Benjamin Moore Swiss Coffee - I love using this white for spaces that pull in a lot of cooler furnishings, like blues and chrome. It helps balance the space by adding a subtle warmth without bringing in too much color. 2- Farrow and Ball Wimborne White - Oh my gosh, if you can afford to splurge on Farrow and Ball paint, PLEASE treat yourself. F&B incorporates more pigments into their paint than their competitors, so throughout the day as the light changes, more colors are pulled out from it. Wimborne White will adapt throughout the day in your space to give you perfect shade of white at that time. 3- Benjamin Moore White Wisp - Another one of my of my go-to picks, White Wisp will give you a clean aesthetic without being too white. This one pulls in a touch of grey and a ton of warmth. Use it with a bright, white trim (see #4) to add some depth to a room. 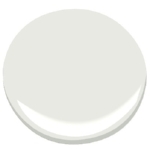 4- Benjamin Moore Decorator's White - Honestly, this is a cult favorite among designers and for good reason. Decorator's White is one of the most pure, clean whites and works well with almost anything. For this reason, this is my go to for trim. 5- Benjamin Moore Chantilly Lace - Similar to choosing a warmer white when I pull in cooler furnishings, Chantilly Lace is a great choice when furnishings in a space are on the warmer side. If you have a lot of wood tones, brass or bronze, consider balancing things out with a cooler white like this one. 6- Sherwin Williams Extra White - I know I've been giving a lot of love to the BM colors, but I do love Sherwin Williams too! For a clean, crisp option, SW Extra White is a safe choice. Choose this color if you're contrasting with a lot of neutral grays and blacks. Off-gassing from paint can lead to a number of health issues due to those pesky VOCs. Don't know what VOCs are? Click here to learn more. I always specify zero-VOC paints for my projects. My favorite is Natura, by Benjamin Moore. Trim is going to get the most abuse, so go with a satin finish or glossy if you're feeling bold. This will allow you to clean without care when your kids wipe their hands all over the door frames. Hope this is helpful! What are some of your favorite whites that I missed? I hope you all are having a wonderful Mother’s Day and if you’re in Chicago, I hope you got outside this weekend to enjoy the INCREDIBLE weather finally. In honor of these summery feels, I’m going to be talking about the benefits of houseplants on today’s Healthy Home, Healthy Life blog post. 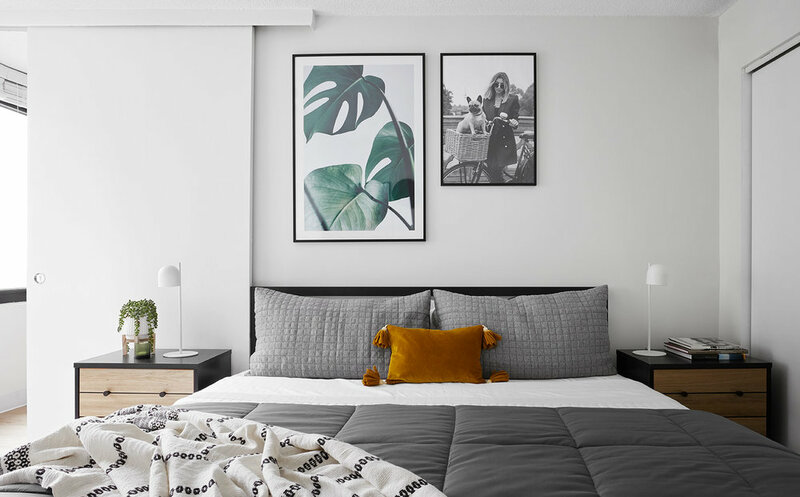 It seems any interiors shot on Pinterest these days features the leaves of a fiddle-leaf fig tree peeking out from somewhere in the room. In addition to providing some added color and texture to a room, houseplants can actually provide a lot of health benefits in your home or office. The most notable of these is the ability for the plants to remove airborne contaminants like VOCs. If you missed the last post, explaining what VOCs are and how they can affect your health, be sure to check it out here. You probably already know how photosynthesis works and that plants take in carbon dioxide in order to produce oxygen. Indoors, this means that they are literally purifying the air you breathe and removing harmful contaminants. In addition to providing cleaner air, studies have also shown that plants lower anxiety and blood pressure levels and help improve productivity. English Ivy is one of my favorites right now. In addition to looking stunning spilling out of its planter, English Ivy is an incredible workhorse. This plant is one of the best to remove mold allergens from the air in your home. If you or your family members suffer from asthma or mold allergies, I highly recommend these plants! They do best in well-lit areas and don’t require a ton of watering. The best part about them is that they spill out of the planter, creating a stunning effect on a bookshelf or coffee table. As I mentioned earlier, Fiddle Leaf Fig Trees are one of the trendiest plants around right now. The huge leaves that make this plant so aesthetically pleasing, also contribute to high levels of air purification and humidity control. A word of warning that these are some of the trickiest plants to keep alive, but so far I’ve been successful with mine, which is quite a feat! South-west light makes these trees the happiest, and once you park them somewhere, don’t move them around, they get moody very quickly. You only need to water them about once a week, once the soil is dry, but I like to give mine some mists from a spray bottle each day to keep the leaves moist and happy. Pot yours and set it in a basket to give a bohemian, relaxed feel. The Snake Plant, also known as Mother-In-Law’s Tongue, is a prime candidate for a plant in your bedroom. These plants convert carbon dioxide into oxygen at night, providing clean, fresh air for a perfect night’s sleep. The best part about it is these plants are nearly impossible to kill. Snake Plants are able to thrive in low-lighting and can dry out between waterings. I recommend planting one in a large floor planter and setting it close to your bed. Sweet dreams! Rubber Plants, another large-leaf stunner is a powerful air purifier as well. These large leaves absorb VOCs from the air, pass it down through the plant, and deposit them into the soil. In addition to removing VOCs, the rubber plant also traps mold and bacteria from the air, reducing levels by 50-60%. Rubber Trees prefer plentiful indirect light and prefer to have soil kept moist during the growing phase and then only need to be watered several times a month during the dormant phase. Make one of these beauties a focal point in your living room and let it work its magic. If you prefer a plant that blooms, bring in a Peace Lily! This sophisticated, flowering plant, is one of the best for removing formaldehyde from indoor spaces. It will also absorb toxic VOCs released by certain cleaning supplies which can make this a great addition to your office desk as well. These plants like moist soil, and will flower best if they’re in darker rooms. The leaves can be poisonous if eaten by kids or plants, so be sure to keep them in higher areas. I suggest bringing a Peace Lily as your next house-warming gift to offset the VOCs released from fresh paint, carpet and furniture after a move. What are some of your favorite houseplants? I hope this has inspired you all to embrace your green thumbs and bring the outdoors inside! I am so excited to kick off our Healthy Home-Healthy Life blog series today! Today is the last day of April (not quite sure HOW that happened already) and May just so happens to be National Asthma and Allergy Awareness Month which means this is the perfect time to start learning about how your home can affect your respiratory health (sorry, I’ll make it cheerful, I promise!) To get things started, I’m going to explain what VOCs are and where they are lurking in your home. I’m excited to announce a new series that I’ll be working on right here on the blog called “Healthy Home, Healthy Life”. See inspiration and images from Devon's latest trip throughout India. Learn what to look for in a designer and how to choose the one that's best for you! 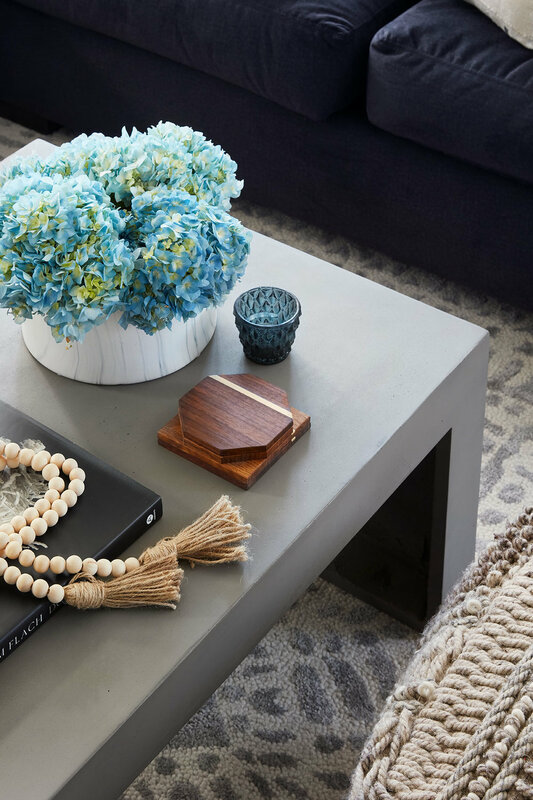 See where I source my favorite home accessories!